Here in Hawaii, the Tantalus 420 bomb is a part of our culture. The actual skate " bomb " down Tantalus, started by Darryl Freeman has been going for well over 10 years now... but who knows how long bombing gatherings have been going on here in Hawaii. The shredders on HOLUA SLED's have been meeting to risk their lives to ride Pele's waves since before we could even imagine. Before surfing, dog town.... all of it. Hawaii is truly the HOME of bombing hills. Here is what my camera captured from this years 420 bomb. 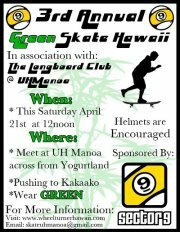 UH MANOA. ACROSS FROM YOGURTLAND. 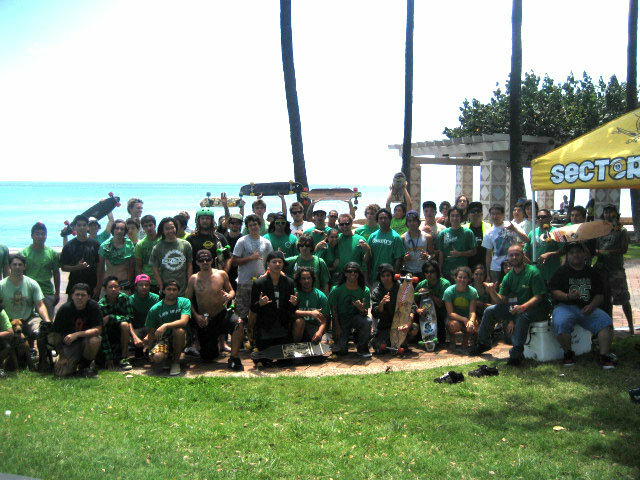 A bunch of the Mililani groms came out to the Tantalus 420 bomb today and shredded HARD. Heres a little video they put together of some of the wheel turning that went down. With the holiday coming up, i figured id do my yearly SUPER AMPED video post. Check out some videos from the past, and stay tuned for some from the upcoming days! To see this ^^^ . Click the HXS links! FOSAL 4 Video By CJ Kang. Meet @ UH Manoa under the tree across from Yogurtland - Pushing to Kakaako Waterfront Park.